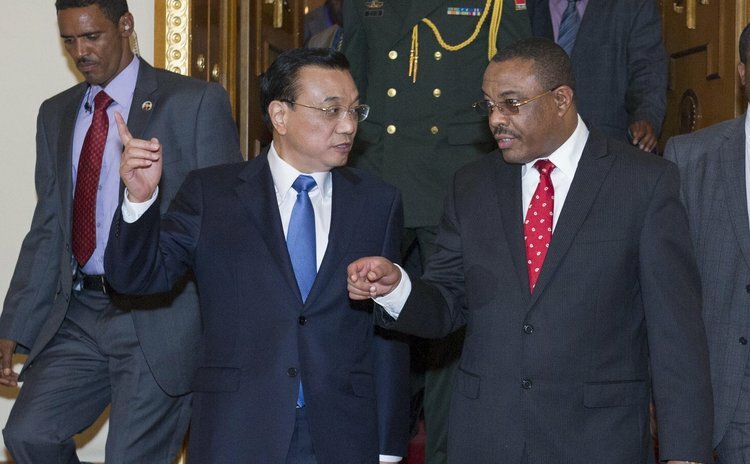 ADDIS ABABA, May 4, 2014 (Xinhua) -- Chinese Premier Li Keqiang (L) talks with Ethiopian Prime Minister Hailemariam Desalegn in Addis Ababa, Ethiopia, May 4, 2014. ADDIS ABABA, May 4 (Xinhua/Sun) -- Chinese Premier Li Keqiang started an Africa tour on Sunday with his arrival in Ethiopia, where he will also visit the headquarters of the African Union (AU). "I am looking forward to an in-depth exchange of views on bilateral issues and issues of common concern with Ethiopian and AU leaders, and ready to promote further development of relations and cooperation between China and Ethiopia as well as the larger AU," Li said upon his arrival here. During his stay, Li will hold talks with Ethiopian Prime Minister Hailemariam Desalegn, meet President Mulatu Teshome and sit down with Chinese and African business leaders to discuss the China-Africa economic and trade cooperation. The Chinese premier is also scheduled to pay a visit to the AU headquarters and deliver a speech there to expound his country's Africa policy and reaffirm Beijing's commitment to deepening the new type of the China-Africa strategic partnership.